The Revomaze Obsession is a new line of plastic puzzles, from the inventor of the metal series (Revomaze Extreme), Chris Pitt. 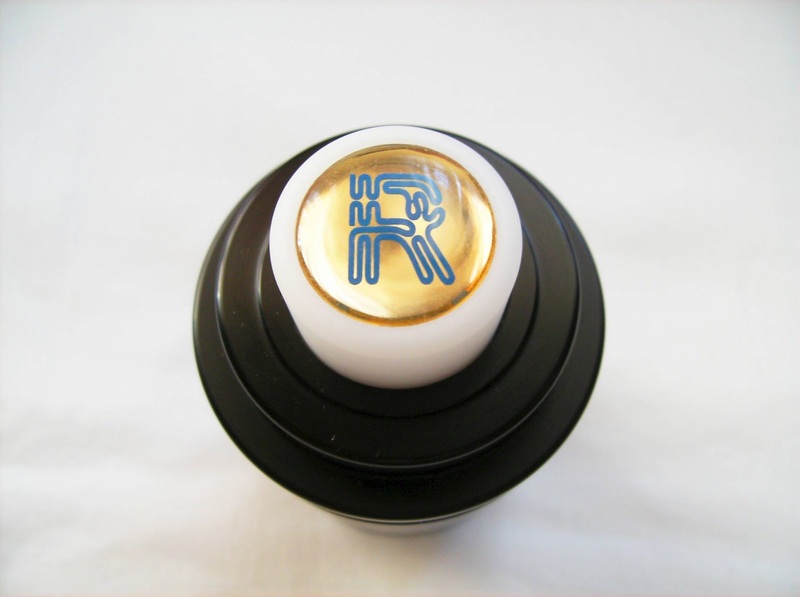 They were launched in the beginning of 2010 and are aimed at a wider audience, mainly because of its reduced price, which is a quarter of the metal ones, and their lighter material, only a third, making them much easier to handle. All the Obsessions have the same internal maze as their metal counterparts and available right now are three levels of difficulty: blue, green and black (red was a limited edition). They also come with a very nice carry pouch. Here for review, I have two Revomaze Obsession puzzles. 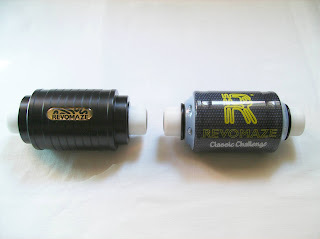 One is the classic design, also used in the Extreme versions, and the other has a completely new look and sleeve design. The inside maze is exactly the same on both puzzles. 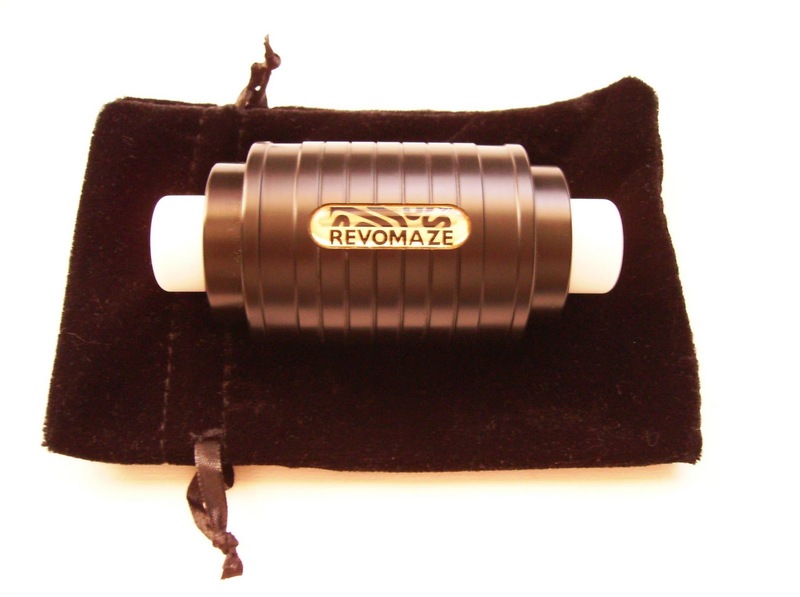 First, I'll start with the basics and with the classic design: The Revomaze is a 'Hidden Maze' or a 'Sleeve-on-Cylinder Maze' puzzle, where you have to guide the central shaft out of the internal maze. Note that, unlike the Extreme, it isn't possible to actually remove the shaft from the puzzle. You still have your certificate at the end to register your puzzle, though. The maze found on the Revomaze puzzles has all the same characteristics of a classic maze, with dead ends and traps and the harder levels will introduce you to some new unexpected features. Navigating your way through the maze, you'll often hear a click sound, meaning that you fell into one of these traps and have to guide your shaft to the beginning and start over. It's very easy and intuitive to reset the puzzle, thanks to the ingenious design that lets loose the shaft and return it to the starting position in no time. The Revomaze is rated in difficulty at a scale of 100, with the blue being 50, the easiest one. By easiest, I mean from the three levels available. The puzzle has nothing easy about it, and requires an average of 6 hours to open. I took around 8 hours total, to finally crack the maze and I was thrilled when I could see the certificate for the first time. With my right hand and arm a bit sore from the experience, I still tried to solve it right after and only took me about a minute or so to do it again. It's amazing how I've spent all those frustrating hours trying to reach the end, and hear those clicks over and over again, just to reopen it in a matter of minutes. The maze is now printed in my memory, but it will be interesting to return to the puzzle after a while without touching it, and see if I can still solve it without falling into a forgotten trap. One thing that you'll notice different from the metal series is that after you solve it, you can't remove the shaft completely from the sleeve. It would have been great to see that evil maze and compare it to the one I've imagined in my head. I do understand that they had to leave something exclusive for the Extremes, otherwise people would just see the difference in material and wouldn't bother spending four times more for an identical puzzle in metal. Soon to be released, is the new version of the Obsession series. The internal maze isn't changed and the shaft remains the same as the old version. The only difference is the design and appearance of the sleeve, which was completely redesigned into a nice smooth and plain surface. 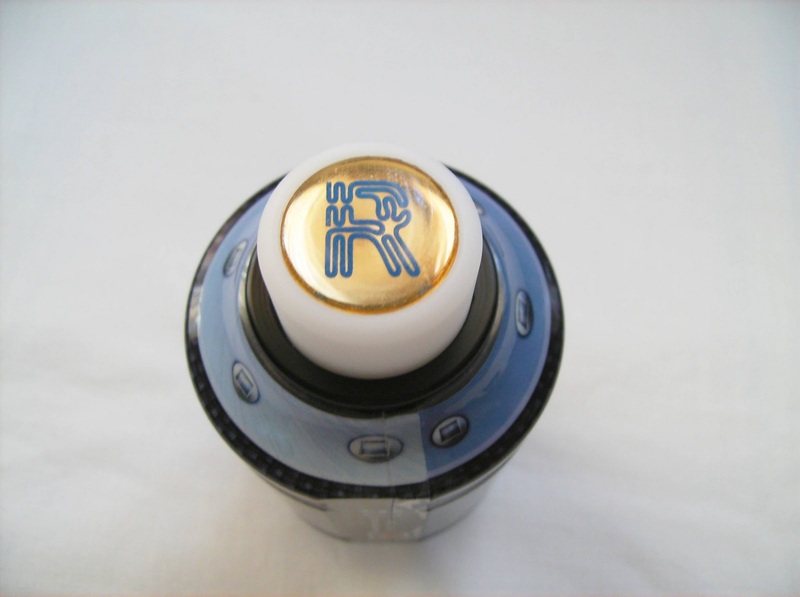 The sleeve is protected with a transparent plastic sheet, giving it a fantastic shiny look and now, instead of the bubble badge sticker, there's a big "R" logo with "Revomaze" and "Classic Challenge" beneath it. Another welcome new feature is that the bottom of the sleeve was flattened, and you can now place your puzzle in a desk for display, without the risk of rolling over to the floor. 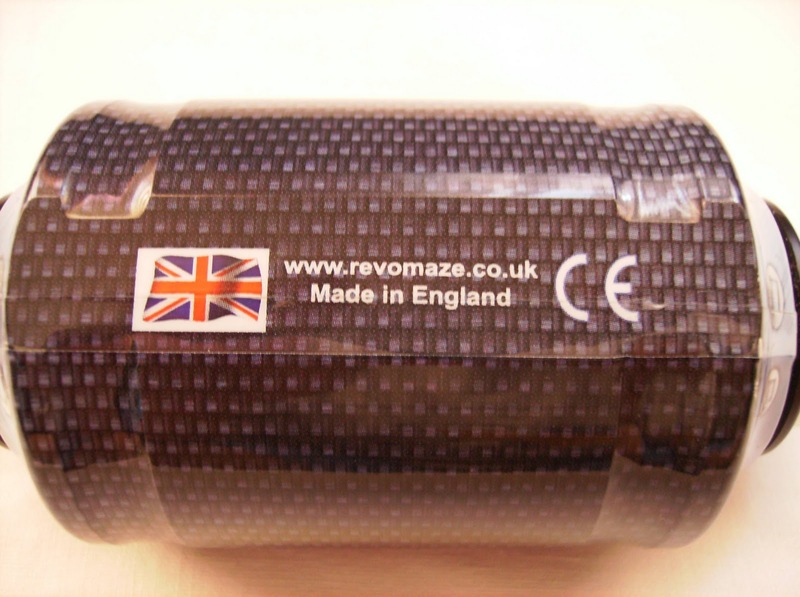 On this flattened surface you can also read the Revomaze website with "Made in England" beneath it and the UK flag with the CE marking, present on each side as well. The Revomaze is one of the most brilliant puzzles I've had the pleasure to solve. Its professional and pleasant outer look, alongside the addictive hidden maze challenge, makes a perfect match for an ingenious puzzle. 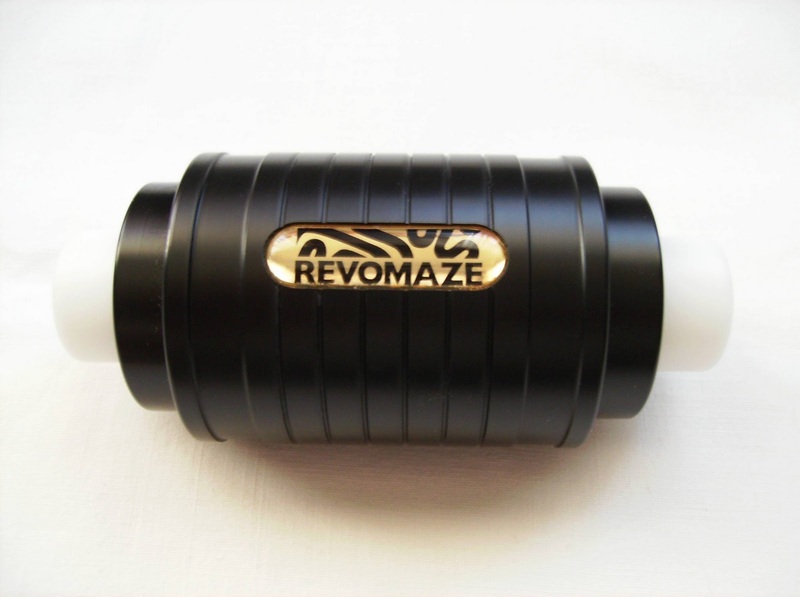 Often described as a true test to your mental and physical capacities, the Revomaze is a tough challenge that will put your patience to the limits. When you own such a great puzzle like this, you feel like you belong to an exclusive club, perhaps too exclusive on some occasions. Since the launch of the first Extreme puzzle, there have been a few limited editions that are no longer available. It's a shame that newcomers like me, won't have a chance to own one of these rare puzzles. If you still want to try one of these unavailable limited editions, go for the Obsession - Black (3rd level), as this one is based on the Extreme Limited Edition - Black. These two puzzles were my first experience with the Revomaze and I must say, I'm addicted. Now that I've solve the Blue Obsession, I want to try the other levels as well. I don't own a metal one right now, but that may change very soon, as I want to know how they feel compared to the plastic ones and of course, because they look much nicer on a shelf. Nevertheless, the Obsession series serve a purpose in which you can experience the sensation of playing with a Revomaze challenge for a much affordable cost... And if you're just into solving, you can get the three levels of the Obsession for less than a price of one Extreme. It's hard to choose between the old and new design. The first has a much simpler and classier design (I love that middle bubble badge logo), and the new one has this cool and stylish look, more modern and definitely has more potential for customization. As of right now, if I had to choose between one of them, I think I'd still go with the old version, although I could change my mind when/if the custom images for the new design, become available for everyone. What about you? Which one do you prefer? Great review! I like the new design idea of choosing our own images. When will this be available? fantastic review I got one for christmas and its driving me to distraction. Every time i think i am getting somewhere "CLICK" and i start all over again. And this is the easy one!! I look forward to cracking it and getting my certificate probably in about 2026.